On July 22nd the new Amsterdam north-south Metro Line 52 will commence operation. Simultaneously the biggest tram service reorganisation in decades will take place. Check this page daily for maps that will highlight and analyse the events as they unfold. for much of its length. This system is very popular in Germany, and our research shows that it makes individual routes easier to follow. Unfortunately, our research (forthcoming) also shows that for the actual task of journey planning, route coloured maps are harder to use than trunk coloured maps. Trunk coloured maps have those routes that follow the same major sections bundled together by using the same colour for each one. The New York City Subway Weekender Map is a good example. The new Amsterdam official diagram attempts something a little bit cleverer, shaded colouring. For this, routes that follow similar major sections are bundled using the same colour category, but different shades of these colours are used to assist identifying individual routes within a bundle. 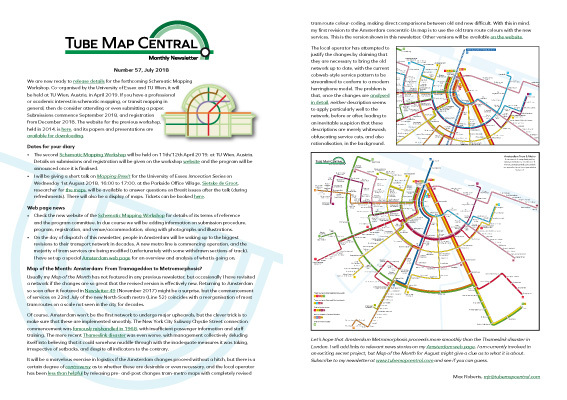 Hence, there are five different shades of green used for the bundle of routes that serve Centraal (west). Unfortunately, our research suggests that shaded colouring is just not worth the effort. It adds colour confusion to the map without giving the assistance that people need at the map configurations where they need it the most. in the clearest way possible (above right). This is the end of my visit to Amsterdam, I hope you found it thought provoking! out-of-date cobweb structure. Of course cobwebs have to be dusted away, in this case replaced with a modern herringbone structure for the network. suspicious, and I sense obfuscation. Perhaps the words were intended to divert people’s attention away from underlying rationalisation and service cuts. The only herringbones here are from red-coloured fish. Now that everyone has understood the new network(! ), on Wednesday I will post my concentric Us map using the new service colours. Map of the Month discusses the new Amsterdam map in more detail. I would be feeling mightily irritated today, and bemused but possibly grateful if I lived along the end of Route 12. On Monday I will post an analysis of what changed exactly. network but, unlike GVB, I will use the old line colours on my diagram! shape and organisation of the city. before and after maps are difficult to identify. and supplementary information, to further distract from making comparisons. Amsterdam maps in English or in Dutch. be valid for only two more days. On Saturday I will post an analysis of which routes are going to change.